There is now another way to download and make the kits from robives.com. As well as memberships, the ricomplete download or individual downloads I'm pleased to announce that I have set up account with Patreon. As a patron you choose how much you would like to pledge for each of the models I design. You can change the amount whenever you want and you can cancel at any time. I usually produce between two and four new models per month. As a patron you can set a monthly maximum pledge so that you never go above your budget. Less commitment than an annual subscription, but more than a one-off model. 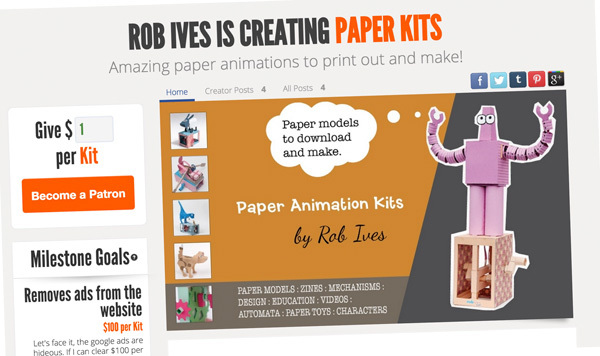 You forgot to mention a active forum, with links to interesting and freebie paper craft! Good point Smelter – I'll see what I can do. ← Spinning Model from Mr Cool!